25 offers found, up to 22% less expensive than the average. We've all seen comical cartoons in which homeowners use pots and pans to catch rain pouring from leaky ceilings. However, nothing's funny about a real storm causing real damage to your roofing. If your home is in need of an emergency roof repair, read on for some essential advice. While not everyone needs to be a roofing expert, you should know a thing or two about emergency roof leak repair, especially if you live in an area where storms are a regular threat. The good news is that most insurance companies will cover the cost of roof leak repairs and storm damage. However, it's still important to perform emergency roofing repair to prevent further damage. If you don't, your claim may be rejected. The best option for emergency roofing repair is to tarp your roof in order to prevent further water damage to your home. Usually, this process involves securing a tarp over the damaged section of your roof with the help of a utility knife, measuring tape, a few 2x4’s, a hand saw, a staple gun, and 3 ¼" nails. However, while it might sound easy to carry out this kind of roof leak repair yourself, remember that working on your roof is dangerous, and you should never attempt to finish an emergency roof leak repair on your own. Instead, seek professional help from a qualified contractor. 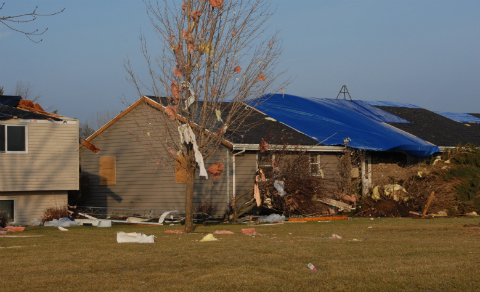 Though every emergency roofing situation is unique, most tarp coverings will last about 90 days. That said, you should aim to finish your roof leak repair as quickly as possible, since not even the best tarp will protect your home as efficiently as real roofing materials. When completing an emergency roof repair, be on the lookout for scams. Roofing frauds known as "storm chasers" notoriously show up unannounced, promise to fix your roof for a low cost, and then disappear without lifting a finger once you've paid them. To avoid this pitfall, always ask roofing contractors for proof of a valid license, insurance, and references. In the interest of safety, roofing contractors generally wait until the bad weather passes to complete an emergency roof repair. Emergency flat roof repair is very different from a pitched roof leak repair, and can be executed during a storm. It involves applying a specifically designed sealing compound as a patch over the roofing. The sealing compound should work when wet, and should not interfere with a proper flat roof repair after the storm is over. If you have a flat roof, it's best to purchase sealing compounds and other necessary products beforehand as a precaution. Although flat roof repair is safer than working on a pitched roof during nasty weather, remain cautious. Never attempt to patch your roof during a thunder or lightning storm. Once you've finished an emergency roof repair, the next step is to contact a qualified roofer for a permanent fix. Do not attempt a roof leak repair yourself, as the consequences of doing it improperly are too costly and dangerous. Check out HomeAdvancement's contractor database to find qualified roofing experts, free of cost. Roof Replacement Estimate: What Should It Include?